Nestled in a desert mountain oasis with the Colorado River at the back doorstep, the Bayshore Inn is your perfect getaway. 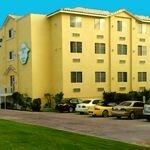 Offering 104 contemporary suites in a daily or weekly fashion, the Bayshore Inn is in a prime spot away from the busy traffic at the casinos, yet only 10 minutes down the road. We pride ourselves with a friendly, fun and relaxing atmosphere within our own little hide-a-away. 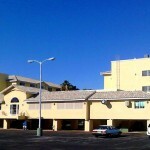 The grounds have unique desert landscapes, an ample well-lit, safe parking lot and several picnic areas. Out the back of the property is our boat and sea doo launching which gives you the ability to head right out on the incredible Colorado River. Not to mention the fishing dock and many other recreations you can achieve on the water. Bellowed down between the two resort buildings is our silky cool swimming pool area. 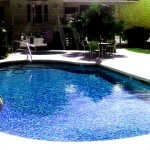 In a gated subset including the 5-foot deep pool is a sweet jet-powered Jacuzzi to ease the tension of your day. Running on a timer, enjoy a session or two of pure bliss. Want even more…you got it…several tables and chairs to ease the mind while refreshing in the water ammenties. Still more…yes…a charcoal grill ready to be used to have your own little picnic while enjoying the breeze and palm tree surroundings. 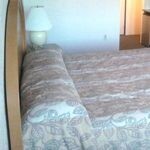 Time for rest and relaxation as all of our fully furnished suites include FREE Cable TV with over 50 channels including the nationals, FREE WiFi, Microwaves and Fridges, plus all the necessities you come to expect from a resort. Enjoy the peace of mind in our rooms with comfortable living space, a modern décor with stunning paintings and ample area to move around. When it comes to cleanliness, it is job #1, as our hospitality department provides you with the service you would expect as if it was your own families dwelling. There’s more…Bayshore Inn has been family owned and operated for decades now. Providing you with FREE coffee in the morning, a 6 video poker, black jack and slot game room, a complete Laundromat with ironing board, a “goodies” canned goods, chips and sweets…and don’t forget about our 24-hour full service bar and gaming hall. 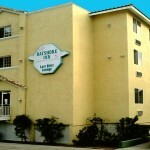 Go to our Amenities page for a full breakdown on all that the Bayshore Inn has amongst its property. Whatever your pleasure we aim to please and make you feel our place is your home. Book your Reservation today!